Afghanistan's Karzai stands alone in high-stakes game with U.S.
KABUL (Reuters) - President Hamid Karzai's stubborn refusal to sign a pact that would keep thousands of U.S. troops in Afghanistan after 2014 is a high-risk gamble that Washington will give in to his demands, one that has left him isolated as the clock runs down on his presidency. Diplomats said he may have over-played his hand, raising the risk of a complete U.S. withdrawal from the insurgency-plagued country where Western troops have fought Taliban militants for the past 12 years. It also risks a backlash at home by critics who believe he is playing a dangerous game with the country's future security. If the bilateral pact is not signed, Western aid running to billions of dollars will be in serious jeopardy, and confidence in the already fragile economy could collapse amid fears that the country will slip back into ethnic fighting or civil war. There was much dismay in Kabul this week after Karzai over-rode the near-unanimous decision of an assembly of nearly 3,000 Afghan tribal elders to back the agreement and introduced new conditions. "What was the point of calling the Jirga (assembly) if Karzai wants to continue haggling with the United States?" said Haji Mursaleen, a prominent elder who travelled all the way from the eastern province of Kunar to attend the assembly. Even Qayum Karzai, who is running in next April's election to succeed his younger brother - while being careful not to criticize the president - told Reuters this week that it was in Afghanistan's "vital interest" to get the pact signed. Hamid Karzai has repeatedly crossed swords with Washington since he became president in 2001, and - anxious about his legacy - he may want to show he is no push-over for the Americans before the elections bring his second and final term to an end. Underlining Karzai's distrust of Washington, Aimal Faizi, his urbane spokesman, told Reuters in Kabul's fortress-like presidential palace: "He has a very suspicious mind because of all the wrongdoings of the U.S. and NATO of the past." Diplomats and politicians say Karzai is likely to hold out as long as he can because, once the deal is signed, he will lose bargaining power and limp to the end of his term a lame duck. "He is a very cunning person and he is in love with his power, more than (Muammar) Gaddafi and Saddam Hussein," said one senior Afghan politician, referring to the defeated leaders of Libya and Iraq. "He has been going against the will of the people all this time ... He does not want to give away his power." Karzai's surprise change of mind at the eleventh hour has triggered a storm of speculation in Kabul over whether it was a reflection of his often erratic and unpredictable character, or part of a longer-term strategy to retain power beyond next year. Karzai, constitutionally ineligible to run again for the presidency, said this week he would not sign the pact until after the election, a move some believe could be the opening gambit of a plan to declare the poll a failure and stay on as president. "He clearly wants to retain control and stay in power, this is obvious. I would not rule out if he cancels or postpones the election for security reasons," said one foreign diplomat in Kabul. "After all, many parts of the country are under Taliban control and elections there are not possible, so he could easily claim that any such election would be invalid." Karzai appears to be betting that Washington will baulk at the so-called "zero option" - a complete withdrawal similar to the pull-out of U.S. troops from post-war Iraq two years ago. Such a withdrawal would leave Afghanistan's embryonic security forces to deal with the persistent Taliban insurgency on their own from 2015. 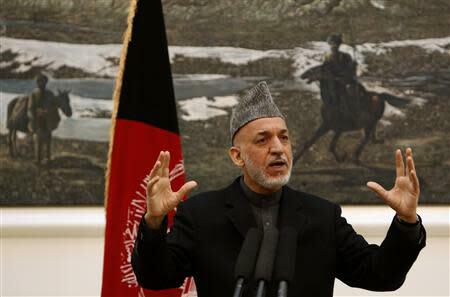 Karzai's team says it is confident U.S. troops would stay. "According to our calculation there will be no zero option. The U.S. is not here to leave the country and withdraw all the troops," said Faizi, Karzai's spokesman. "The president is willing to sign this agreement now that this has been approved by the people of Afghanistan ... There is no doubt it will be signed. But the president has some pre-conditions." Karzai now wants the United States to guarantee that U.S. forces would not raid Afghan homes under any circumstances, that Washington would help kick-start stalled peace talks with the Taliban, and release Afghan prisoners from Guantanamo Bay. He also believes Washington is not putting enough pressure on neighboring Pakistan to stop militants using its territory as a safe haven from which to wage the insurgency in Afghanistan, and may be using the pact as leverage to make the Americans try harder. But he appears increasingly to be fighting a lone battle even at home, including among those who have long stood by him. "He is alone and isolated on this. He doesn't seem to have much support," said one Western diplomat in Kabul. "Who is left with him on this? The only people who oppose (the pact) are Karzai and the Taliban." As talks between U.S. and Afghan officials drag on, the United States appears to be losing patience, saying it may pull out all troops altogether if Karzai holds up the Bilateral Security Agreement (BSA) any longer. Karzai's assumption that Washington sees Afghanistan as too important a strategic interest to drop may be misplaced. Indeed, U.S. National Security Advisor Susan Rice, who was in Kabul this week for a round of tense talks with Karzai, said if there was no deal soon, Washington would "have no choice". "I must say that I was sad and disappointed that by the end of our meeting it was clear he (Karzai) is not yet prepared to sign that agreement promptly," she told Afghanistan Tolo TV. Many Afghans agree, saying Karzai is attempting to appear anti-American in the eyes of the Taliban at a time when he is trying to engage the insurgents in peace talks. "It is not in the interest of Afghanistan to delay signing the BSA," said Hanayat Hafiz, a Jirga member from Wardak province. "Karzai's move is aimed at appeasing the insurgents."